DREADLOCKS EXTENSIONS- BACK-COMB & CROCHET NEEDLE. Please scroll down this page to see the estimate for this type of Dreadlocks services. loc extensions on fine hair texture. This is a picture of the hair extension, before it was loc. I used human hair to create the loc extension. Client was happy after the Loc extensions process was done. The Human hair cost .......................................................................................$ 130.00 per package of hair. The Synthetic hair extensions: .......................................................................... $ 65.00 per package of hair. To create the loc extensions, the starting price is .............................................$ 496.00 & Up. To Attach Locs Extensions ................................................................................$ 358.00 & Up. 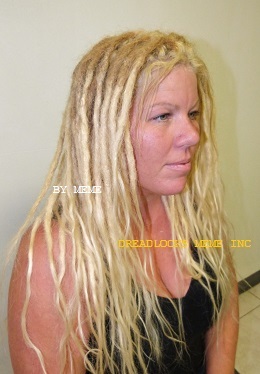 Consultation is required for this type of Dreadlocks service. 10 to 20 minutes consultation............................................................................$27.00 fee is applied. 1. Hair will have to be washed a day prior to service. 4. Prepare the hair extensions. 5. Loc the hair extensions. 7. There are about 10 more steps to finish this dreadlocks extensions. 8. That is the only information we choose to share with our viewers. 9. 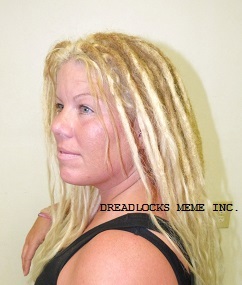 A consultation is required for this type of dreadlocks services. 10. This process can take from 4 to 6 days to finish. 11. To Schedule an appointment a deposit of $200.00 is required. (At the time of your consultation). please no kids under 12 years old in the hair salon.